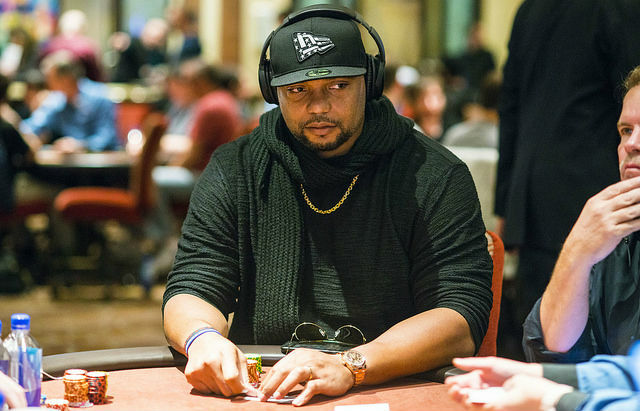 Since retiring from the National Football League after the 2012 season, Richard Seymour has become a regular on the live poker tournament scene. As Day 2 of the World Poker Tour Five Diamond Classic gets underway in Las Vegas, Seymour is one of the players unbagging chips. “From playing a while now I’m a lot more selective in the events that I choose and this is just one of the best tournaments of the year,” said Seymour, who finished 18th in this event last year. A deep run this year means Seymour, who lives in an Atlanta suburb, won’t be able to attend Saturday’s Georgia High School football state championship game. The Five Diamond runs through Sunday night. “Yeah, I will have a conflict, but I think I’ll have to stay and watch it on TV,” laughed Seymour. Seymour’s playing career included three Super Bowl titles with the New England Patriots, seven Pro Bowl appearances and a spot on the Patriots’ All-2000s team. Seymour played cards as a kid and then played Texas Hold’em with his Patriots teammates. Once his career ended, Seymour was looking for an outlet for his competitive side and found it through poker. Along with making the final two tables last year, Seymour has cashed four other times and has $103,799 in lifetime WPT earnings. He’s picked up $36,159 in cashes in other events. The Five Diamond marks his return to the felt after a bit of a break. “I’ve only played once since the Main Event. Probably a little rusty, but I’m probably one of the only guys I know that comes to Vegas to relax. Most of these poker guys – they’re grinding,” said Seymour. During his time on the circuit, Seymour has a made a few friends, including Jason Koon. Their friendship is less about poker, and more about their backgrounds. Seymour starts Day 2 with 35,000.